Ukraine’s government has a problem on its hands: A far-right group has tapped into growing frustration among Ukrainians over the declining economy and tepid support from the West. 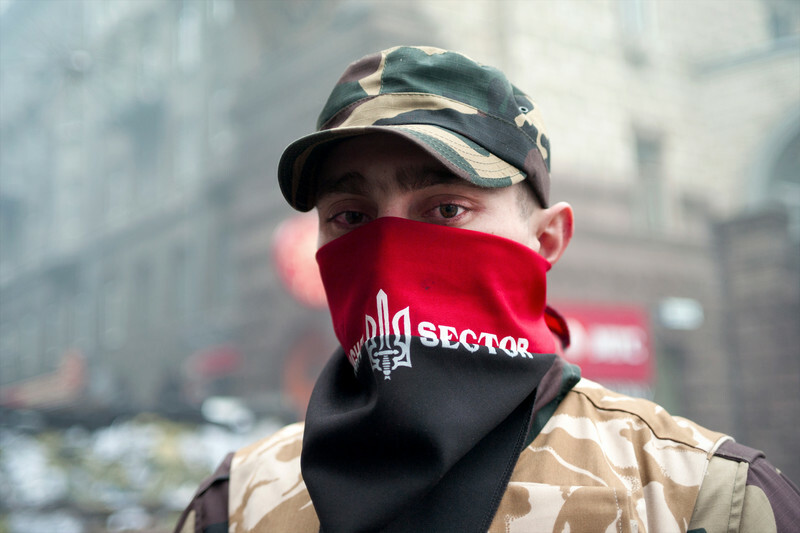 Right Sector (Pravy Sektor) has a dangerous agenda. In the most direct challenge to Kyiv’s government, Right Sector announced that it will begin organising a national referendum on the population’s distrust of Ukraine’s parliament, cabinet, and the president. A call for an illegitimate and unmonitored referendum against the government will neither unite Ukrainians nor help Ukraine’s reformers navigate the country’s difficult economic situation. The referendum call came at a 21 July rally in Kyiv at which the Right Sector’s leader and only member of parliament, Dmytro Yarosh, demanded that the government's "Anti-terrorist operation" (ATO) in eastern Ukraine be called what it actually is: a war with Russia. He also called for a full blockade of the separatist-controlled regions of Luhansk and Donetsk; and legalisation of all volunteer battalions fighting in Ukraine’s east, which the Ukrainian military has been struggling to incorporate. Yarosh refused to give up his seat in parliament but claimed that Right Sector–which is both a political party and a paramilitary organisation–would not participate in the local elections in October. There is a glimmer of good news for the Ukrainian government. A majority of Ukrainians do not support Right Sector. The party holds one seat in parliament (Yarosh’s) and Yarosh received less than one percent of the vote in the presidential elections in May 2014. However, the government would be ill-advised to dismiss Right Sector outright. It must do more to address Ukrainians’ legitimate concerns about their future, but the government can’t do this alone. Economists agree Ukraine requires a much greater injection of macro-economic assistance than the International Monetary Fund’s promised package of $17.5 billion to bring the country back from the brink of collapse. The $50 billion called for by George Soros is the minimum “lifeline” that Ukraine needs to survive. Without this injection of financial support, groups like the Right Sector will continue to make political noise that distracts from the real work that Ukraine’s leaders must do. Right Sector has surely been a thorn in Kyiv’s side. The group’s meeting in Kyiv followed on the heels of a confrontation between Right Sector, police, and local authorities in the western town of Mukacheve on 11 July. The shootout left five dead and fourteen wounded. The armed conflict in Mukacheve was, in part, a result of the government’s push to bring under control the many volunteer battalions that have been fighting in Ukraine’s east. Volunteers returning from the front lines report fighting with regular Russian army forces, not Ukrainian separatists. While the Ukrainian government has repeatedly said that tens of thousands of Russian troops are fighting in eastern Ukraine, it has refused to call the conflict a war, preferring to use the ambiguous ATO label. The government has a legitimate reason for this ambiguity: calling the conflict a war would cut off Ukraine from much needed financial assistance from international lending agencies, such as the International Monetary Fund, which do not provide assistance to countries at war. However, as evidence of Russian troops and military bases in Ukraine mounts, volunteer fighters have grown frustrated with the language from Kyiv’s officials. As President Petro Poroshenko’s falling approval ratings show (17 percent according to some polls), Ukrainians are getting fed up, too. This frustration should not come as a surprise: reform governments are rarely popular, and this one has had to push through particularly painful reforms, including a 400-percent increase in gas prices and deep cuts in social programmes. Investment in the private sector has stalled. Despite Ukraine’s wealth in natural resources and an educated labour force, few investors are willing to take on the risk of doing business in such an unstable environment. Groups like the Right Sector, which claim to have Ukraine’s national interests at heart, are simply taking advantage of public frustration to ratchet up support for their misguided agenda. Despite its revolutionary rhetoric and anti-government stance, Right Sector is unlikely to succeed: Since independence, Ukrainians have shown themselves to be cautious when it comes to supporting extremist movements. Still, it is important to take this distraction for the government in Kiev off the table. Western leaders must connect the dots: Ukraine needs economic relief and political support. Without this, opportunistic and populist groups will continue to divert attention from the real challenges ahead. Alina Polyakova is Associate Director in the Atlantic Council’s Eurasia Center. 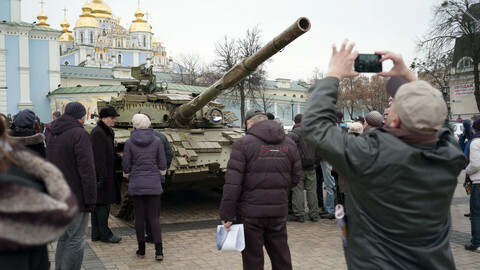 Canadian photojournalist Christopher Bobyn reports from the contact line in the Ukraine-Russia conflict.